I'm a take-the-high-road kind of girl and have tried to be for as long as I can remember. Let me tell you-- It's not always easy. I've nearly bitten my tongue off more times than I can count but when it comes to friends and loved ones, I figure it's best to zip the lips in the heat of the moment regardless of how UNsatisfying it may be. 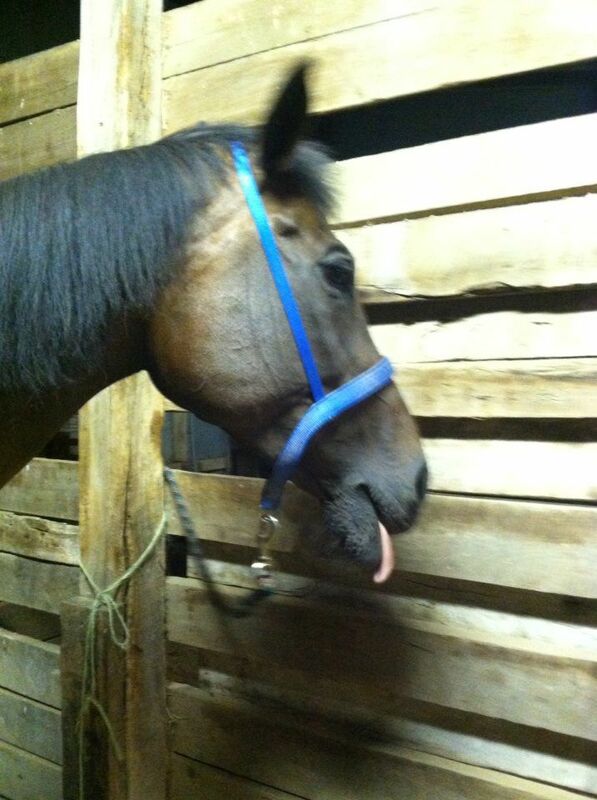 This is a picture of my niece's horse, Tilly. I think this sassy mare might be on to something. Next time someone pushes my buttons, instead of "zipping it" on my way up the high road, I'll simply stick my tongue out at them and move on. Maybe it'll leave them wondering what I'm up to. Ha! I guess that's a much better approach than sticking fingers in ears, and Loudly saying," La-la-la. I can't hear you!!!" Which is what I've been tempted to do when someone pushes my buttons. LOL! I've gotten better at zipping my lip since I have gotten older....not perfect, but better. I guess I've done more biting my tongue than sticking it out, but sticking it out sometime might be fun. I, too, am of the "high road" persuasion. But sometimes, it just gets hard, doesn't it? Ha! I love the photo -- and yes, I try, too, to be of the "high road" but it is hard. It'll be a little easier after retirement! Funny you should ask... My personal improvement project lately has been to ZIP IT!! I do, however, make iternal monster faces at them. I have a very hard time lately, keeping my mouth shut. It's a hard thing to do. Living with 3 stepkids right now has been a huge problem for me to hold my tongue. Maybe I just need a salt likc?? Would you call that :horse sense"? good advice Joanna, but difficult to take! Better in the long run I think. I, too, have a hard time keeping my mouth shut. I like to think that I've gotten some better about it as I've grown older though, but it's still hard! I have a bloody tongue for a while ....and a grin to match! Have a great weekend! My character flaw (one of many, unfortunately) is that when I do manage to take the high road, I want a committee of at least 5 to gallop over and acknowledge how morally superior I've just been. It's a cute photo. I imagine it is nice to have a horse. It is one way to take. I mostly keep my mouth shut (except when it comes to my kids), but I like Tilly's idea. I might try it. Fortunately, incidents that require taking a "road" seem to be lessening. Maybe I'm getting smarter; can see it coming and manage to avoid it. However, that's not always the case. I called a customer service rep yesterday to ask a question. She misunderstood and got a little sarcastic. I took the "high road" and said, "Maybe I should be quiet and let you ask the questions," albeit, that was probably a little sarcastic, too. She apologized and said, "No, it's me that's not being clear." After that, we were good. ps. Good shot Tilly with her tongue out! I'm sure I'm mentioned that I love horses. I'm not very good at keeping my mouth shut or my tongue inside of it. I think zip the lips is a wise policy. The high road lets you bypass regret street. It depends what the disagreement is about... but that horse has the right idea perhaps? I'm generally pretty good at zipping it, except when dealing with family...then I don't seem to have any filters at all. Something I have been working on. The art of sticking your tongue out takes practice to get just the right effect. Remember that famous Einstein photo of his tongue. Maybe because he was already famous he pull it off so well. You should post a few practice photos. Generally, refraining from comment is safest. I almost always regret it when I don't! I think Tilly has the right idea. It might just be worth a shot. I have always had a bit of a problem not speaking my mind...and it got worse over my years of working in the field of sexual assault, I'm afraid. I have learned the finesse of blasting someone in a more refined manner - but it's not nearly as satisfying as being up front with my feelings.